Kids, Cuddles and Muddy Puddles: German for Kids: Krabbeltiere Suche! - Minibeast Hunt! 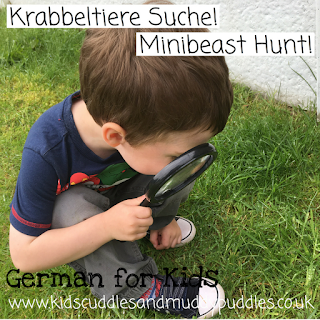 German for Kids: Krabbeltiere Suche! 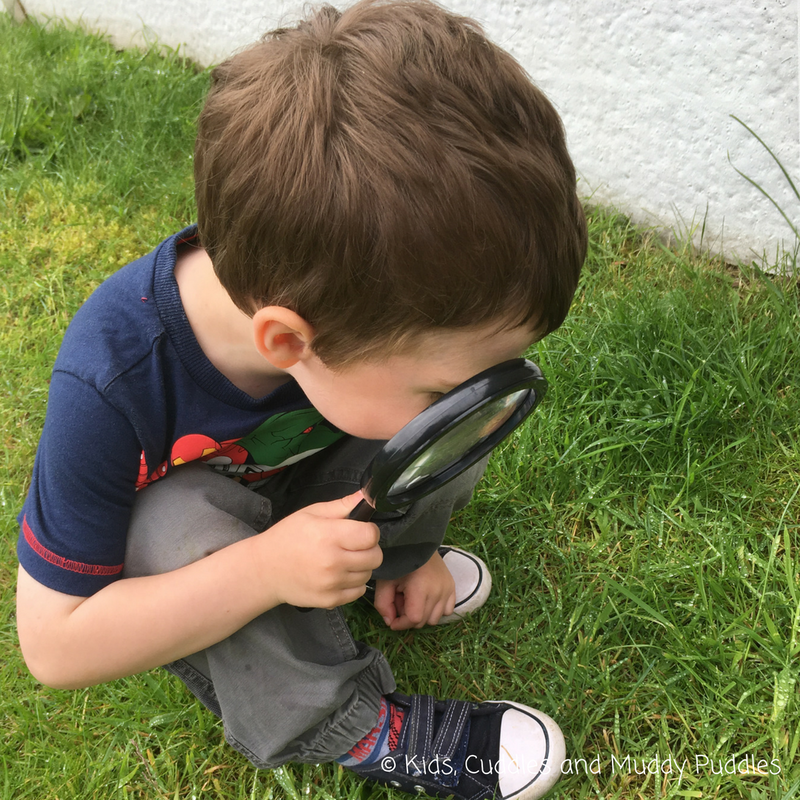 - Minibeast Hunt! 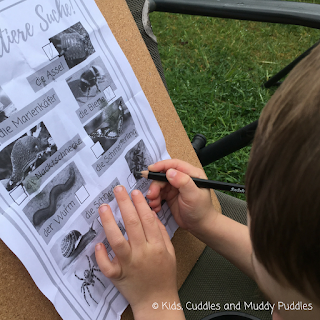 This week, we took our German lesson outdoors! 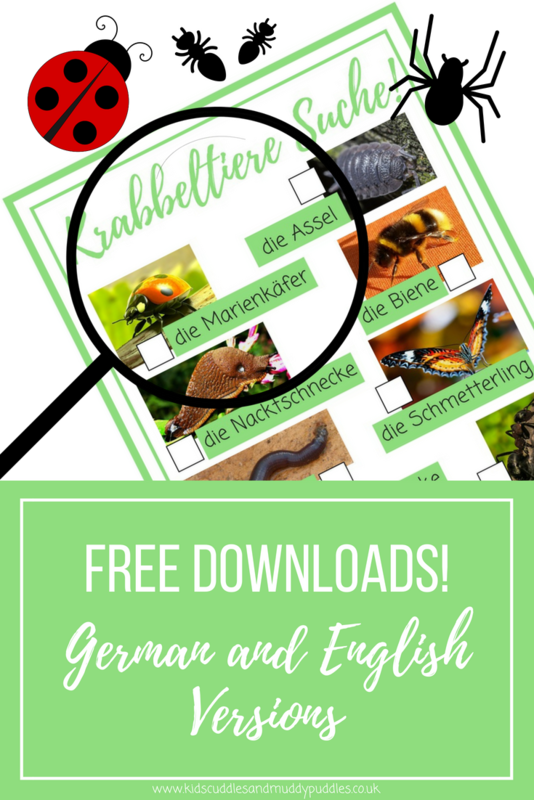 My son was set some half term homework to go on a minibeast hunt so I decided to use the opportunity to introduce some new topic related German vocabulary! A "Krabbeltiere Suche" was born! I put together a tick list of common little creatures found in British gardens, and added bright colour photographs to aid learning. (You can download it for free at the end of this post.) We spent a little while saying the new German words and repeating them, and having a giggle at some of the funny translations! The kids found the literal English translation of slug really funny - die Nacktschnecke means the naked snail! As with any new learning, revising what you already know is really important as it aids memory and fills the children with confidence. We recapped our German numbers to 10 (and up to 5 for my 2 year old daughter) by counting objects in the garden. Find out how I taught my children numbers in a multisensory way in our previous posts, Fünf kleine Entchen - Five little ducks and Fünf Osterküken - Five Easter Chicks. Then we played a little game of "Suche!" (Search!) This is a fab little activity for reinforcing numbers, new vocabulary and a gentle introduction to how words change when they are plural. For example, I'd say, "Suche drei Blumen!" and point to a flower and say "Dass ist eine Blume," so they knew what die Blume was. Other examples I used were, "Suche sechs Blätter" - Search for 6 leaves; "Suche zwei Fußbälle" - Search for 2 footballs. They enjoyed running around the garden finding things for me! It was time for the minibeast hunt! Krabbeln means to creep or crawl, and Tiere are animals so this was the closest translation to minibeasts or creepy crawlies I could find! 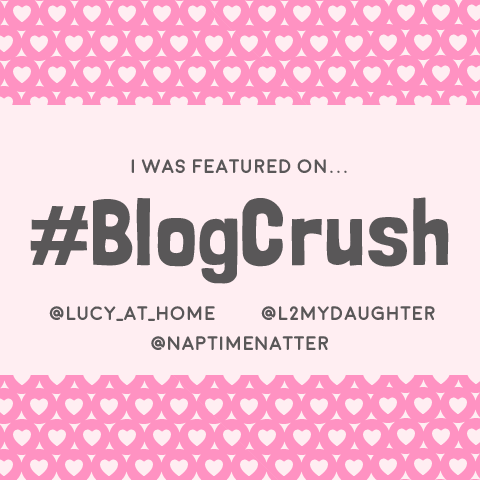 The children liked the sound of it and shouted it out as they set off searching with their list and their magnifying glasses! I pretty much left them exploring for a while and each time they found something, we'd check its German name on the list and tick it off. Not long after, my son was dropping in the vocab into his sentences! So he'd say something like, "Look Mummy, I found another die Spinne!" or, "There's die Biene!" It doesn't matter that he was using die/der (the) in places he didn't need too or not using eine/ein for a or an. Just the fact that he is confident enough to use the German noun is enough to show he's taking it all in! We had a great time in the garden, learning hands on outdoors. In fact, the tick sheet is still stuck to our makeshift clipboard (one of my table mats!) in the lounge and my son keeps adding ticks to it each time he finds Krabbeltiere! 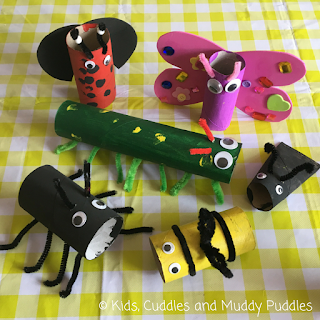 We decided to put our massive collection of toilet roll tubes to good use and create some bugs too. We simply used them, plus paint, pipe cleaners, googly eyes and little gems to make our minibeasts. We practiced saying the German name for them and used our number knowledge to count them in German too. 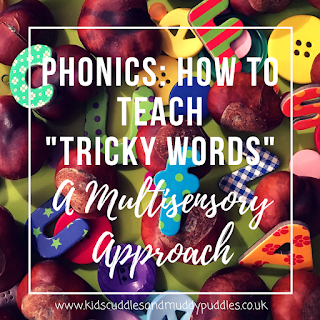 I love this gentle, multisensory approach to learning languages. It's much easier to engage young children if the topic and activities interest them. We really enjoyed our German bug hunt experience, and the children gained a lot from it too. Not only did they learn new German vocabulary, but it meant something to them as they could use it in context. This is the key to all good language acquisition, especially at a young age. 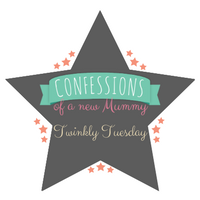 I'd love to know if you have a go at the Krabbeltiere Suche! You can download three versions here for free. 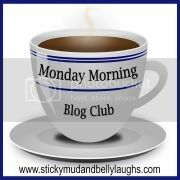 I only ask that if you do use our downloads, you pop back to our blog here and leave us a comment to let us know how you got on! I look forward to hearing from you soon. Finding joy in the little things: Every day since introducing the new vocab for our minibeast hunt, my 4 year old has been spotting creepy crawlies and telling me their German names! I love how keen he is to use his new language skills and how natural sounding it is when he says it. It's as if he's using the German translation in place of the English word like it's just the normal word to use! If a second language is drip fed to youngsters in this way, they are more likely to use it willingly and without a fuss! And this just proves it! This is such a cute idea! My kids really enjoy learning different languages and doing nature scavenger hunts, so we will definitely be heading to the park to try this out. I took German in college and lasted ONE semester and got a C. I switched to Spanish after that, lol. Great idea to start them young. I found it a very hard language to learn. They are really enjoying the practical approach! Hoping to try more soon.